Richard Dawkins, 1998, Houghton Mifflin Co. The title of this book comes from a line in John Keats’ poem ‘Lamia.’ In one verse of that poem, Keats accused Newton of unweaving the rainbow, having destroyed the beauty of the rainbow by explaining the physical principles that result in the formation of rainbows. Dawkins, in defense of Newton, argues through many enlightening examples that an understanding of our physical reality in terms of its own laws leads to an appreciation of beauty and intricacies of the world in ways that Keats could never have imagined. 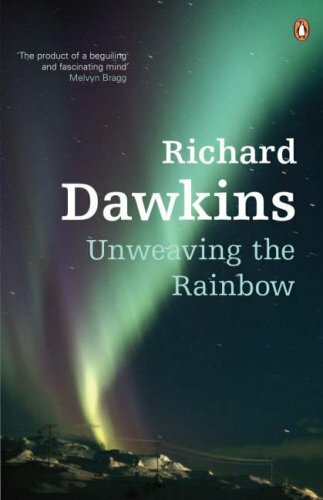 Starting with light and what can be known about distant stars by the properties of the light they emit (after it is scientifically unwoven), Dawkins explores our current understanding and its limits with an uncanny ability to draw the reader into his sense of wonder. The breadth of his exploration is impressive: cells, stars, genes, fossils, our brain, and more. To accentuate the magnitude of Keats’ error, Dawkins laces his scientific explanations in almost every chapter with appropriate poetry and poetic prose from Yeats, Lawrence, Nehru, Wordsworth, and Feynman , among many others. Coming from a scientific background, I was unappreciative of the interlaced poetry at first, preferring more straight-line prose, but I warmed to it and found it effective in the end. Keats’ disappreciation of science is still with us today, even if it is not as poetic. Dawkins convincingly argues that there is a real danger in the widening gap between scientific progress and the scientific literacy of the populace. Because humans have a sense of wonder, and because science is often hard to understand, there is a ready market for pseudoscientific explanations, simply because they are easier. The gap is also easily exploited by lawyers attempting to plant doubt in the minds of jurors who must decide a case based on DNA evidence that appears incontrovertible to those who understand the methods and jargon. Antiscientific attitudes grow because of the gap; because as Dawkins admonishes, scientists are not actively engaged in explaining their science to the public. If the gap is not narrowed, science is in danger of becoming ever more marginalized as a basis for understanding anything important to the growing mass of the scientifically illiterate. The poet and the scientist, although very far apart in their craft, are, as Dawkins argues, motivated by the same sense of wonder. Where one draws on the mystical and supernatural to express awe, the other brings reason and imagination in attempt at deeper understanding. In the end, Dawkins accomplishes his goal of showing that within our understanding of rainbows lies a more awe-inspiring sense of wonder. Health care…do you feel lucky?